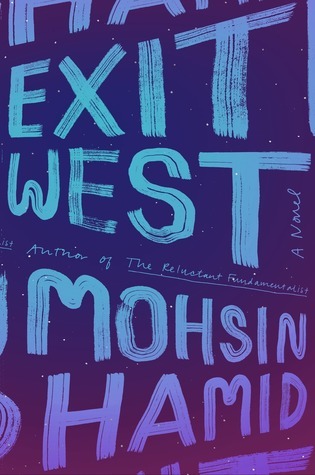 Exit West, a novel by Mohsin Hamid, appeared on many Best of 2017 lists in the book world, and I had heard several intriguing interviews with the author on my favorite book podcasts last year. My husband gave me the book for my birthday last summer, and I finally read it last month. This unique, thoughtful, and compelling novel was a great way to start the new year! Saeed and Nadia live in an unnamed Muslim country when they meet and begin tentatively dating. Their budding relationship is moved forward rather quickly, though, as their country is embroiled in a civil war, and their city becomes a violent, frightening, and unsafe place. The two come together to keep each other - and Saeed's father - safe amid bombings and other destructive violence. Then, something entirely new and unforeseen happens. Mysterious doors begin to emerge all over the world, including in their city. Word is that you walk through these black doors and emerge into an entirely different part of the world - a random town or city in a far-away country. Things can't get much worse than where they are, so Nadia and Saeed combine their savings, pay someone off, and decide to walk through one of these doorways. They end up in a more peaceful place, but that country is struggling with the sudden influx of immigrants. Nadia and Saeed make their way across the globe, with several journeys through different doors, as the world is rocked by this new type of immigration. I loved this imaginative story that combines the very intimate lives of this new couple with the emerging global problems created by the doors. The immigration controversies that better-off countries are dealing with today in the real world are amplified in this brave new world where thousands of people can move to a new country simply by walking through a door. Hamid has found a very clever and thought-provoking way to explore these issues. At the same time, this slim novel is also a love story, following the arc of a relationship, from its beginning. The complexities and evolution of the relationship are paralleled with the more global evolution of a new world order. I was captivated from beginning to end of this creative and introspective story of love, immigration, and worldwide changes. Disclosure: This book was from my own shelves. My review is my own opinion. Or order Exit West from Book Depository, with free shipping worldwide. I haven't heard of this novel, but it sounds so timely and good. So, so, so good, Helen! And very unique and creative! I've been wondering about whether to read this one--I'm trying to read some of the Tournament of Books finalists and this is on the list. It's quite different in setting than most of what I read, and I like the fact that you found it imaginative--that's an intriguing word to me. Good review--I think I might try this one. It's an interesting book, Jane, because the concept is a bit sci fi or fantasy - magical doors that take you to a different place - but the story is 100% real-world, about a couple whose relationship evolves and their difficulties finding a place in the world after escaping the war in their own country. I think you'll like it!